Among the social groups in India, scheduled tribes (STs) have the highest proportion of the poor. While they account for only 8% of the total population, they comprise 40% of the displaced population. Literacy rate among STs is only is less than half of the general population, and that of rural tribal women about one-fourth. The Government of India has allocated significant amount of resources for tribal development, but the impact has been rather limited. The approach adopted has been more welfare-oriented, and there has been less emphasis on the issue of empowerment. This programme proposes to use the opportunity created by the recent constitutional amendment concerning the extension of the Panchayats Act to Scheduled Areas and would assist the state governments in putting into practice the principles established by this act in empowering the local communities and in establishing collaborative relationships with communities for designing resource management strategies which meet their perceptions and aspirations. The programme covers two tribal populated states of India viz. Chhattisgarh and Jharkhand. The target groups comprises all households in the selected villages, i. e. villages with tribal, Primitive Tribal Groups (PTGs) and scheduled caste population of not less than 50% of the total population where the majority of the households live below the poverty line. The objective of the Programme is to develop and implement a replicable model that ensures household food security and improves livelihood opportunities and overall quality of life of the tribal population based on the sustainable and equitable use of natural resources. To achieve this, the Programme :- i) empowers tribal grassroots associations and users' groups, including women and other marginal groups; ii) promotes activities which generate sustainable increases in production and productivity of land and water resources; and iii) generates sources of income outside of agriculture, particularly for the landless. The basic approach is to promote processes of awareness generation, legal literacy, social analysis and mobilisation for self-selecting group formation among disadvantaged women and marginalised groups. The programme supports initiatives identified, planned and implemented by beneficiaries and provides the required resources and support. The resources are managed directly by the beneficiaries after appropriate training and capacity building. 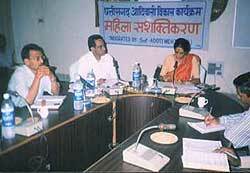 These are supplied through NGOs with a proven experience in applying such approaches. The proposed programme has three main components. Under the beneficiary empowerment and capacity building component, the programme finances broad based awareness raising of tribal rights and of gender and equity issues, legal and managerial strengthening, and technical training. Similarly, under livelihood systems enhancement, the programme finances all production-related activities as well as enabling measures, namely land and water management/ watershed development, including community-based small infrastructures; production systems improvement; rural micro-finance; and health and nutrition. Under the programme management and implementation component, the programme finances salary and allowances for Programme Implementation Unit (PIU) staff at District level, the relevant running costs for the Tribal Development Society and a skeleton Programme Management Unit (PMU), a legal defence fund, specialised and baseline studies, training for the staff and the development of training material, exposure visits, study tours, and technical assistance, and the costs of capacity building of facilitating NGOs and their contractual support services. Develop and implement a replicable model that ensures household food security and improves livelihood opportunities and overall quality of life of the tribal population based on the sustainable and equitable use of natural resources.